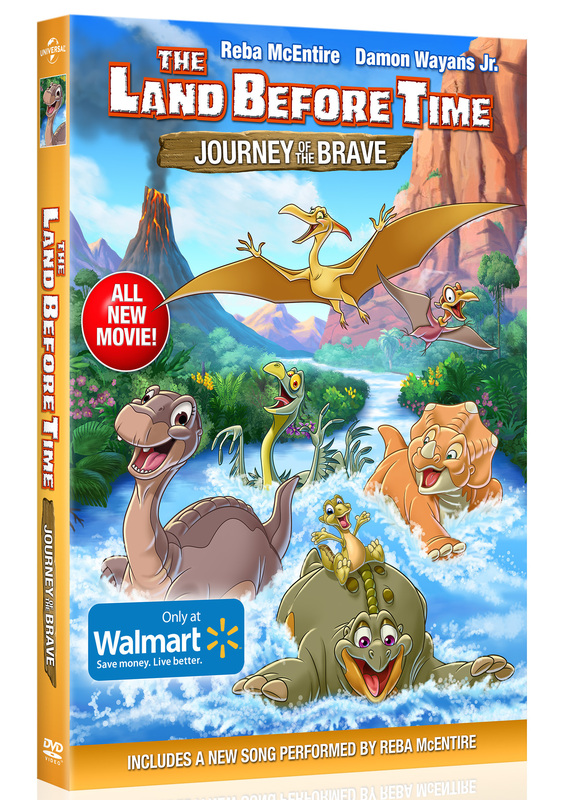 Next week marks the new release of The Land Before Time: Journey of the Brave from Universal 1440 Entertainment coming to Digital HD and exclusively on DVD at Walmart February 2nd! Inspired by the 1988 classic feature film produced by Steven Spielberg, George Lucas, Kathleen Kennedy and Frank Marshall, The Land Before Time: Journey of the Brave DVD will be available only at Walmart and walmart.com. In conjunction with this release, comes The Land Before Time compilation album. The album features some of the best-loved songs from all of the previous Land Before Time films and will be available digitally January 29, 2016, on Back Lot Music. In this exciting and heartwarming adventure, young Apatosaurus Littlefoot and his four dinosaur pals, Cera, Ducky, Petrie and Spike, embark on an ambitious quest to find Littlefoot’s missing dad, making new friends and learning valuable life lessons along the way. New to the hugely popular franchise is the Queen of Country Music, Reba McEntire voicing one of two new characters, Etta. The Golden Globe and Grammy nominee also performs 1 of the 4 all new songs in the movie, “Look for the Light.” Voicing the second new character is none other than Critics’ Choice TV Award Nominee, Damon Wayans Jr. as Wild Arms. Check out the sneak peek of the newest movie Land Before Time movie!